As part of a two-city roadshow which hits Montreal today, representatives from Louisiana were in Toronto yesterday to showcase what there is to do in the destination and highlight the state’s new marketing campaign, Feed Your Soul. Airing in Canada and the US, the new promotion and rebranding focuses on what makes Louisiana authentic like the food, music, history, culture, artisan goods and lots of adventure. Although the state faced a decline in tourism following Hurricane Katrina in 2005, he said tourism has rebounded. With direct airlift on Air Canada, lots of developments underway like the recent announcement that Disney Cruise Line will add a new home port in New Orleans in 2020, he hopes Canadian tourism to the state will continue to be strong. Meanwhile, representatives from Visit Baton Rouge, Lafayette, and New Orleans Plantation Country were also on hand to promote their respective destinations. From dancehall to boudin tours, Jesse Guidry, vice president of communications at Lafayette Convention and Visitors Commission says there is plenty for visitors to do in the city dubbed the Happiest City in America. While the food scene is huge, being in Cajun & Creole Country, he says he’s also focusing on promoting activities in the great outdoors. One example is the Vermilion Voyage, a three-day overnight paddle down the Bayou Vermilion in March. With the Tabasco factory nearby, he says travellers can also take part in a tour and see where the peppers are grown. He says the destination also offers a family-friendly alternative to Mardi Gras. According to Jo Banner, communications manager for the New Orleans Plantation Country, once you’ve seen one plantation house, you haven’t seen them all. Beyond the tours of plantation houses, swamp and walking tours, she says the area has been used as a filming location for over 1,000 scenes in movies, TV Shows and music videos, including Interview With The Vampire, and multiple Beyoncé videos. It’s important for potential visitors to note that the capital city offers more than just politics and football says Christy Chachere Lohmann, communications specialist for Visit Baton Rouge, although those are certainly still abundant. Calling it the tailgating capital, she says college football is huge, with a stadium that holds 102,000 spectators. Beyond the two staples, she says Baton Rouge has a thriving culinary scene, plenty of music festivals, as well as food and walking tours with lots of distilleries and breweries popping up. As for travel agents, Megan Ryburn, director of sales, Louisiana Office of Tourism says there are lots of opportunities for FAM trips. Overall Louisiana saw 47.1 million visitors in 2017. 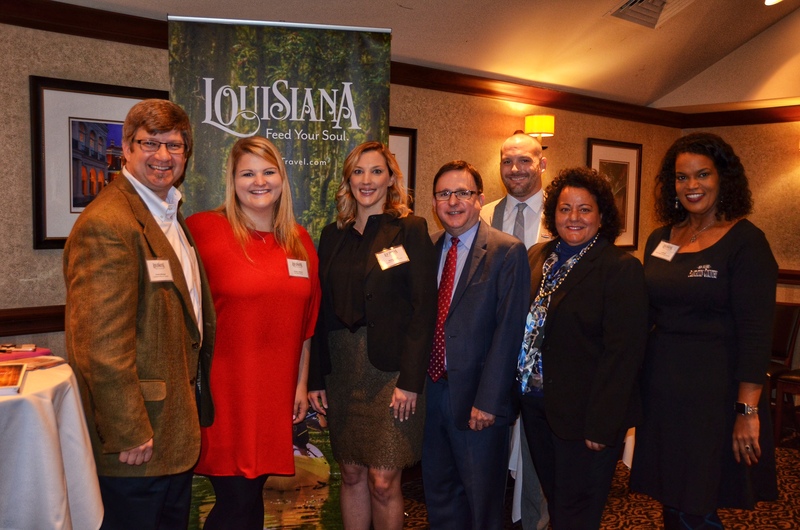 Pictured at the event held at Ruth’s Chris Steak House are (l-r) Charlie Whinham, Louisiana Office of Tourism; Christy Chachere Lohmann, Visit Baton Rouge; Megan Ryburn, Louisiana Office of Tourism; Doug Bourgeois, Louisiana Office of Tourism; Jesse Guidry, Lafayette Convention and Visitors Commission; Joanne Scalamogna of Access Marketing and Jo Banner, New Orleans Plantation Country.